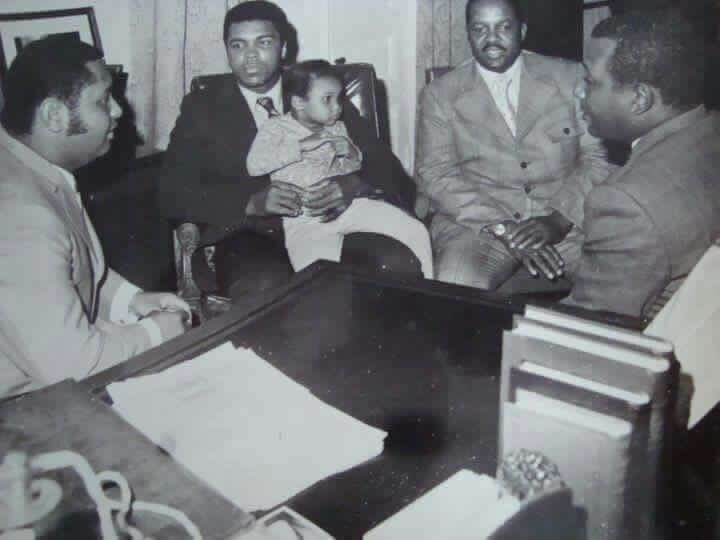 The son of former Haitian dictator Jean-Claude Duvalier, Nicolas Duvalier share a rare, never seen before picture f his father and the former Heavyweight Champion of the World Muhammad Ali. Nicolas Duvalier twitted Muhammad Ali and my father Jean-Claude Duvalier. Duvalier State Funeral not Happening. Ex-President Jean-Claude Duvalier, who died of a heart attack on October 4th, is not going to be honored with a state funeral, a relief to Haitian rights groups. A tweet President Martelly posted, saying Duvalier was an "authentic child of the country" caused a surge of fear to spread among the public a state funeral would be held for Duvalier, under whose rule tens of thousands of Haitians were massacred, tortured, abducted, or forced to flee for their lives. Migration of the country's professionals left Haiti bereft of its intelligentsia from which it has never recovered. When Martelly's tweet went viral, Haitians blanketed social media to protest. They also began an online petition urging Martelly ". . . to respect the memory and dignity of the victims whose deaths . . . have never been officially recognized by the country." Jean-Claude Duvalier, the self proclaimed Haitian "President for Life" died from a heart attack on October 4th, 2014 at the age of 63. Duvalier, at the age of 19, inherited power from his father Francois "Papa Doc" Duvalier and became the President of Haiti from 1971 to 1986. His regime is considered as one of the darkest, brutal and corrupt regime in Haiti. His father was a doctor (that is why his son was as known as 'Baby Doc') who was more ruthless and corrupt than his son. He established 'Noirisme' i.e., uniting the Haitian black majority with African roots against the mulatto elite in the country. Both father and son ruled the country with iron fists, clamping down on dissidents, crushing opposition, making own tyrannical rules and pocketing public money. His son Duvalier had extensively used a secret police force named 'Tonton Macoutes' which was heavily accused of torturing, kidnapping, and killing up to 30,000 political opponents during the 1960s and 1970s. 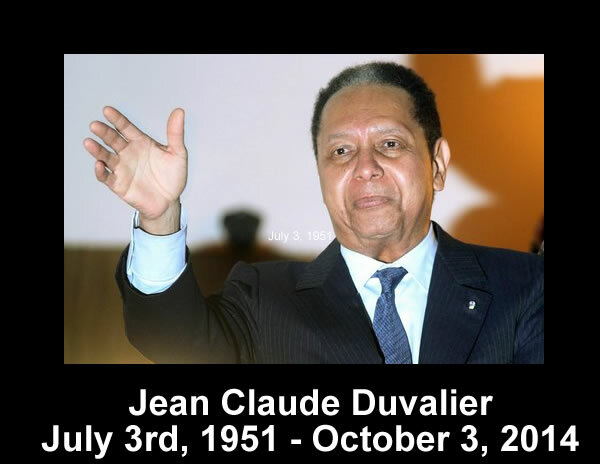 Jean-Claude Duvalier (also known as Baby Doc) who presided over Haiti for 15 years between 1971 and 1986, has died on Saturday October 4, 2014, from a heart attack at the home of a friend in Port-au-Prince where he had been staying. His administration was widely acknowledged as one of the most brutal and corrupt regime that Haiti has ever had. He used to call himself "president for life" but his lavish lifestyle and tyrannical 15-year rule sparked a massive uprising that overthrown and sent him into exile in France for a quarter century. In 1971, he became the world's youngest president at the age of 19 when his father Francois Duvalier suddenly died of an illness and he inherited power from his father. Francois "Papa Doc" Duvalier was a medical doctor who turned into a ruthless dictator, far more than his son who was less violent and less repressive than his father. The senior Duvalier was infamous for 'Noirisme' that advocates total control of the state apparatus by black representatives with African roots. It is one kind of racial redefinition of national identity as opposed to multiculturalism and it dictates to respect the African traditions only. Will Jean Claude Duvalier's Coffin be covered with a Black and Red or Blue and Red Flag? There's been a lot of debate and disagreements since the death of former Haitian Dictator Jean-Claude on what type of funeral to give him. Why many Haitians think we should receive a State Funeral, many more disagreed. Finally the government of Michele Martelly has decided on State funeral for the former dictator. The crisis is not over. Now, what color of flag should we use for his flag-draped casket? To go back into history, when Francois Duvalier was elected president in 1957, he adopted a new constitution which restored the black and red flag. 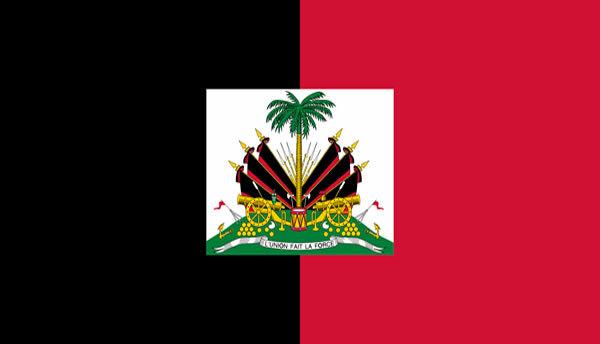 From 1964 to 1986 the Black and Red flag was the official flag of Haiti. It would not go back to its current Blue and red until Jean Claude Duvalier went into exile in France. Should there be a State National Funeral for Jean Claude Duvalier? 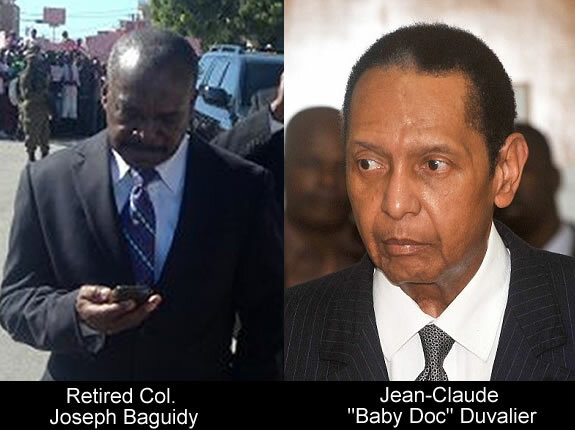 One of the attorney for the former Haitian Dictator, Me Reynold Georges, stated that the National funeral for Jean Claude Duvalier are in the planning stage at this time. However, the government of Martelly-Lamothe has not made public their decision at this time. National funeral, just like it was done recently for former President Leslie Manigat, is natural. However, Former President Jean Claude Duvalier is in a case by itself. He has many enemies who would tell you he should have have a National funeral. February 7, 1986 will forever remain a historic day in Haiti. It was on that day that Jean Claude Duvalier dove with his family in their Mercedes to the airport where a pre-arranged US government flight took them to Paris for exile. The cause of his ousting from power was a combination of several issues: the deepening of poverty in Haiti, corruption and a lavish lifestyle initiated by the new First Lady, Michele Bennett. While life was beautiful at the National Palace in Port-au-Prince, the Haitian population was falling deeper and deeper into poverty. 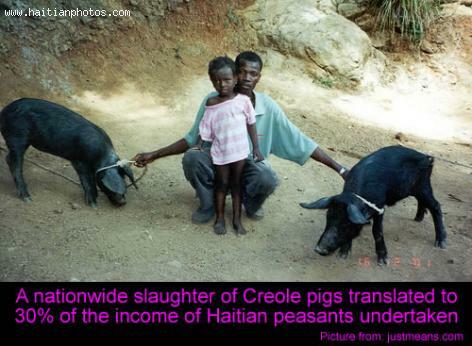 The biggest single event that caused the population to be fed up with the government was the eradication of Creole pig. 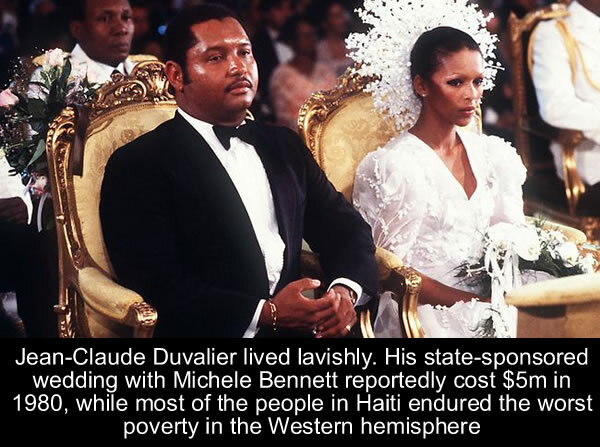 The state-sponsored wedding between Former Haitian Dictator Jean Claude Duvalier and a member of the Mulato elite in Haiti,Michèle Bennett, was reported to be one of the most expensive weddings of the time. This wedding also comes to signal a new alliance in the Haitian society, The union represents a new aliance between Noirisme that has been promoted by the Duvalierists and the mulatto elite class. Michèle Bennett was the daughter of a wealthy coffee merchant. Her father, Ernest Bennett, took advantage of his presidential connection to increase his wealth. We have some more information on the death of Haiti former Dictator Jean Claude Duvalier. We learned that he was paying a visit to a close friend, retired Col. Joseph Baguidy at his home when he collapsed and hit his head. According to HCNN, an insider news agency. On Saturday, October, Jean Claude Duvalier was at the home of retired Col. Joseph Baguidy, when he died. Members of the group who have been pursuing Jean Claude Duvalier to court for abuse of their human rights learned with shock the death of the former Dictator. 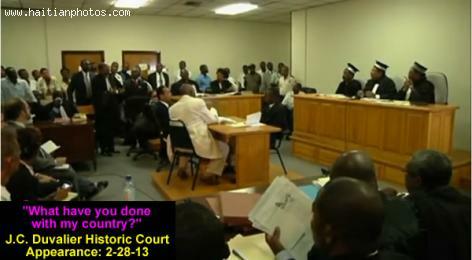 This is a terrible news, said Mr. Daniele Magloire, "Another Dictator is dead without being judged in Court. The Death of Jean Claude Duvalier does not put an end to the ongoing fight of the victims to find justice. The militants as well as some international advocates for Human rights swear to contimue with their fight for justice. "Those who were the victims of his reign are still living in Haiti"